In honor of Valentine’s Day (who are we kidding – let’s make it Valentine’s Weekend, right? ), I’ve got a great book for you: equal parts romance, mystery, and adventure, this might count as a guilty pleasure if not for the fabulously crafted Shakespeare allusions and literary details. Swoon! In Juliet, Anne Fortier explores an intriguing idea: Romeo and Juliet is a true story, and the ancient feud between the Montagues and the Capulets still rages on today. 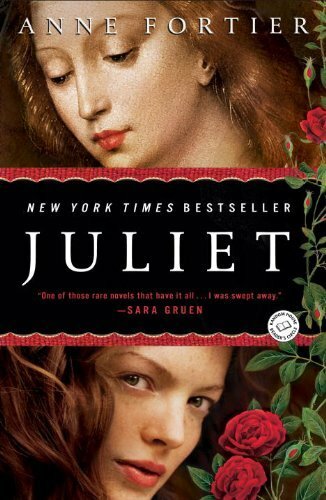 The book intertwines the narratives of Giulietta, the original Juliet, and Julie Jacobs, our modern-day heroine who just happens to be a direct descendant of the Capulet family. Julie’s great-aunt Rose drops that little family secret bombshell in a letter that Julie opens upon Rose’s death. Also in the envelope is a passport in Julie’s real name (Giulietta Tolomei), a key to a safety deposit box in Siena, Italy, and a promise of buried treasure there, far more valuable than Julie could guess. With that, Julie is off to her homeland of Italy, and our story begins. As Julie learns more about the legacy of her ancestor’s famous blood feud, we also get to experience history firsthand from Giulietta’s perspective. Apparently, Shakespeare got a lot of things right about this “true story,” but he had a lot of things wrong, too. It’s fun watching a new version of R&J unfold, even if this one doesn’t have Leonardo DiCaprio in it (you can still imagine – there’s a great little romance nestled in these pages, too. Of course!). Both the modern and the 1340 narrative work together to solve the central mysteries: will Julie find out what exactly happened to her famous ancestor? Will she be able to escape Mercutio’s curse (“A plague on both your houses!”), especially as some unseemly characters in the town of Siena discover who she is and what she’s in search of? And if Julie finds her Romeo in Italy, will their ending be happy or just as tragic? In the spirit of the holiday, I can say without feeling too cheesy that I loved this book. To me, Juliet is the perfect combination of fun and depth: I didn’t feel like I was losing brain cells reading it – quite the opposite – but I also felt perfectly swept up in the romance and adventure. If you take a chance on this book today, I think you will love it too. Reading Juliet does result in a burning temptation though: to plan a trip to Italy. Maybe next year’s Valentine’s treat?